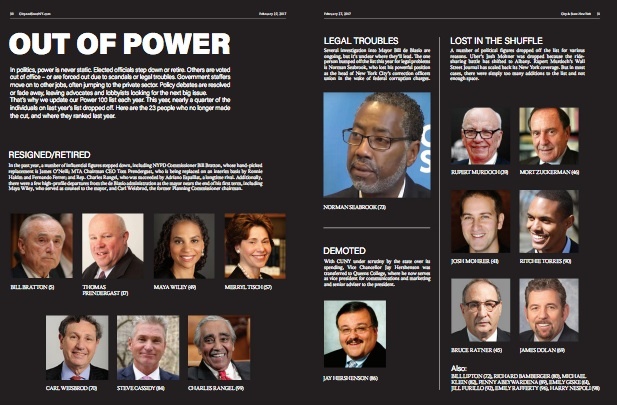 According to the latest edition of City & State magazine's New York City Power 100, Forest City Ratner Chairman Bruce Ratner, last year ranked at #45 ("seems as strong as ever thanks to his close relationship with the de Blasio administration") is off the list, "lost in the shuffle" along with such luminaries as Rupert Murdoch (previously #39), Mort Zuckerman (#46), and James Dolan (#69). Well, these lists are always arbitrary, but it was a year without much progress--two building starts have been delayed, and Forest City Ratner's parent company announced an unspecified delay in Atlantic Yards/Pacific Park. And Ratner was nudged out, unceremoniously, from the board of Forest City Realty Trust, and slammed by activist investors. Still, if he and CEO MaryAnne Gilmartin manage to get a huge project approved at Site 5, getting the state to agree to transfer bulk from the arena block across the street, well, that will reaffirm significant clout. And it's not like the state has refused any such requests.